Are you brand new to digital marketing and unsure how to get started? This article covers the five main channels you need to understand, with a broad overview that will help you get a feel for how to use online marketing to grow your business. Digital marketing in 2019 is complex. But it’s not the complexity of execution that’s so hard. In fact, marketing today is less technical and more automated than ever. What’s complex is figuring out how digital marketing fits into your overall business strategy. We’re faced with the thoroughly modern problem of having too many choices. Even for small local businesses, there are so many digital marketing channels and tactics available that a simple business strategy morphs into complexity. The internet is vast, and it’s also mobile. Businesses have to find a way to fit their message into an endless, diverse content stream. Marketing is also more personalized than ever. Digital technology tracks us on an individual basis. Consumers now expect businesses to know them (or at least their buying habits) and provide tailored promotional material. Because of all of this, there is a lot of customization with today’s marketing strategies. Just like online users, individual businesses are unique. Where you are, who you target, what you’re offering, and who you’re competing with have a major impact on your marketing approach. Today’s marketing also involves a great deal more content creation than years past. A few decades ago, most local businesses got by with just a yellow page ad and word of mouth. Today, businesses are expected to educate, interact socially, and personalize the buying journey. It opens up a lot of opportunities to connect with people, but also creates a lot of work. Every business is also under a microscope. Online consumers are all critics, and reviews can have a big impact on lead-generation. So let’s paint some broad strokes to clarify this. Below are the five main digital marketing channels/concepts you need to understand to get started in 2019. Get grounded with these ideas and you’ll be able to set goals and plan the tactics that will work for your business. Search marketing is the channel you’re probably most familiar with – assuming you’ve used Google. Paid search is run through Google Ads and for many home contractor businesses, Local Service Ads. Bing also offers paid search services. With paid search ads, you’re paying Google to favorably position your ads and drive traffic to your website or to provide you a lead. The most common payment method is pay per click, which means you pay a certain amount every time someone clicks on your ad and visits your website. You also may pay for impressions, which means you pay when your ad displays on someone’s screen. Local service ads is a pay per lead system where your ranking is determined by customer feedback and reviews. Ecommerce sites will use Google Shopping to display products within the shopping network. These are also PPC ads. Paid search marketing is an important channel for most businesses, particularly when you’re starting your marketing. It provides the fastest, most direct way to get in front of prospects who have a strong intent to hire or buy. Part of paid search marketing is retargeting, which is where you display ads to people who’ve already visited your website. This is a powerful advertising tactic across both search and social media. Online paid search platforms are auction-based, meaning you bid against competitors for top placement on search results pages. However, it’s not just a straight-up bid auction. The systems also want to display relevant content to users, so they have a Quality score that evaluates your content. A high score indicates your content is a strong match for the intent of the search. When you have high quality scores, your cost per click is lower for top results. This is one of the main management goals of paid advertising. Your other goal is return on investment. With paid search, you have to maintain an investment that allows you to be competitive. Ultimately, that investment must pay-off. Google and Facebook both have metrics that allow you to measure your return on ad spend (ROAS). You set a conversion value and get a metric that directly shows your ROAS by comparing what you earned through conversions with your ad spend. In fact, you can set things up so the systems target a certain ROAS, meaning the algorithm will target audiences likely to deliver the ROAS you set. One thing to remember with search advertising ROI is the lifetime value of your customers. Your one-to-one ROAS may not always be profitable, but if you win a valuable repeat customer you get a strong return. 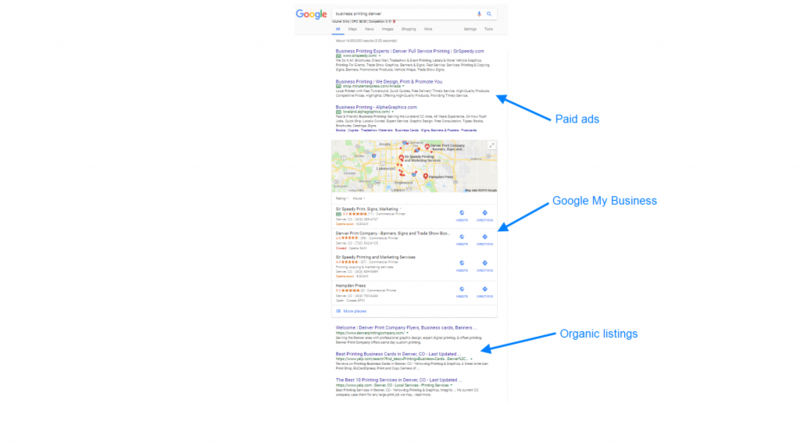 Organic search results appear under paid ads, including local Google My Business listings. You don’t pay when someone clicks on these, however there is still an investment of time and effort involved in getting your content to rank. For businesses with a local location or service area, Google My Business is an important organic search channel. This ties into maps (you have to verify your location) and reviews (how you’re ranked is influenced by customer reviews). Below the business listing are the rest of the organic listings, which are a mix of anything Google deems relevant for the search query. Informational content tends to rank organically, even when the intent of the search is transactional. Usually, you tie content creation efforts together with keyword targets for your SEO (search engine optimization strategy). Organic search can produce excellent ROI, but it takes time to move up in the rankings, and ultimately you’re at Google’s mercy as to how you rank. The more information gaps you can fill with prospects, the better chance you have to develop a robust organic search strategy. Today social media occupies a lot of time for people online. It has major potential as an advertising channel, but it’s arguably the most complex to deal with. Organic social media exposure is pretty limited at this point, so we’ll only talk about the paid channel here. Probably the biggest question you have early on is whether or not you should advertise on social media at all. The answer to the question is probably yes; most businesses benefit from some level of social media marketing. However, the approach is different from search marketing because social media ads are primarily outbound. Search marketing is what we call inbound marketing. When someone does a search, they show specific intent. When they discover you, they come to you. On social media, your ads are outbound. They primarily target audiences new to your brand who are not explicitly looking for what you offer. Analyze whether you can target a valuable audience on social media. For example, if you’re selling clothes to teenage girls, then advertising on Instagram is a no-brainer. However, if you’re a local plumber who needs to generate leads, social media probably won’t directly deliver that result. One thing about social media – and in particular Facebook – is that it is a great place to test advertising content with specific audiences. If there is a cohort of people with a particular interest you think would buy your product, you can get in front of them and test their responses. Also, social media is excellent for branding campaigns if you have those goals. Facebook will target particular actions (such as liking a post or watching part of a video) with precision. You can then build audiences and scale your campaigns to move people through your buying cycle. The Facebook Ads platform is complex, and you have to be careful about how you develop campaigns. Most ads are pay per impression, and if you don’t watch what you’re doing you can waste a lot of money. On the other hand, if all you do is dabble with a minimal budget, you’re unlikely to build the momentum needed to deliver significant results. Unless you have a lot of time, Facebook/Instagram ads are a good channel to outsource to a company like Marketing 360®. The internet opened a channel of communication for consumers that proved to have a big impact on business marketing. Today, planning the reputation your business will develop is part of your marketing strategy. You have to consider what your customers will say about you because they don’t just say it to a neighbor. They publish on the internet. Remember that two of the channels we’ve discussed, Google My Business and Facebook, are both places where people leave reviews. Yelp, Home Advisor, and Top Rated Local all have a big impact on the perception people have of your business. That perception does – without question – impact prospective customers. A strong review profile can really boost lead-generation and sales, while a poor one can sink a business. The most important step in reputation management is addressing your customer service and the quality of your offerings. If people love what you do and you treat them fairly, your reputation will largely take care of itself. You can take management steps if issues arise, which include asking happy customers for reviews so you can eventually displace the poor ones. From the beginning, start planning your business around developing a strong reputation. It’s an important aspect of your marketing. One of the most important concepts you need to be clear about when you start digital marketing is conversion-based design. Conversion-based design is just that – designing marketing materials that prioritize conversion, which is the action you’re trying to motivate (such as hire or buy from you). As you start, you might think this is obvious. Of course you’ll create this stuff to persuade people to work with you. But of all the marketing concepts we’ve outlined here, staying focused on conversions is the one business tend to lose sight of. We see this most often on websites. Instead of building a site based on the needs of visitors, business owners end up with vanity projects. They think their website is cool, but as a communication tool (in particular as one that persuades people to act) it fails. All of the online marketing and advertising collateral you develop should be connected to a business goal. Most of the time, the goal is to trigger a response in your target audience and provide them with means to act. Don’t lose sight of these goals. Maintain a sense of empathy with your audience – put yourself in their shoes. Look at the work you’re creating as objectively as you can. When you feel your bias is getting too strong (and it will) ask for others to look at your material with fresh eyes. Focusing on conversions means focusing on – and getting to intimately know – your audience. That is one of the most valuable things you can do as a marketer. The last aspect of digital marketing you need to get a handle on is data. Digital marketing is inexorably connected to data. The way we develop advertising platforms – from the outset – is connected to how they’ll capture data on users. What you’ll soon discover with digital marketing is that there is far more data available than you can ever use (or even grasp). Google Analytics/Ads and Facebook Ads are data labyrinths that offer virtually endless reporting options. But you can’t ignore data with digital channels. It needs to be part of your marketing mentality. This is because, at a basic level, marketing is trial and error. It’s not an exact science. You use data to determine what works and what doesn’t. Your goal is to do more of what achieves your goals while eliminating what proves ineffective. Fortunately, the Marketing 360® software system helps business owners a great deal with data analysis by narrowing things down to the main goals and KPIs. We’ve done the work of selecting the most important data points for small businesses and organizing them by channel so you can understand your marketing data without having to sift through endless metrics and reports. Most novice marketers feel intimidated by digital marketing – with good reason. These are deep waters with strong currents. Of course we’ve only scratched the surface here, but in a way, that’s the point. As a business owner, you’re never going to gain mastery of all the digital marketing channels. Shoot, nobody really does, because just when you think you know everything, it changes. Facebook, in particular, is notorious for continuously changing their platform. You don’t have to know every detail about how these channels work. But you do need to have a basic grasp of the marketing principles connected to them. You can’t hope to gain from search or social media marketing if you don’t have a vision for how the technology will make a connection to the people you want to reach. So as you get started, approach digital marketing strategically instead of tactically. Consider who you need to communicate with – and what you need to say – first. When you have a strategy in place, you can start to set goals and plan some tactics. And of course, you can enlist the help of a company like Marketing 360®. We live this stuff and have the latest insights and tools to help with these all-important digital marketing channels. Contact us today to chat with a marketing consultant. Advice and answers are free, and you can get a feel for how we support SMBs as they navigate digital marketing.